Hebru Brantley’s paintings focus on energetic narratives. He takes his life and the lives of his peers mixed to fantastical fiction- to create a fragmented environment of make believe. Hebru Brantley, living and working in Chicago, explores personal and cultural memory in his art. Taking themes from his 1980’s upbringing, His creative process employs a variety of surfaces and medium including wood, spray paint and even coffee and tea. His work delves into political and social issues with a conscious focus on playful insight and the optimism and possibilities of youth. He breaks down the walls of cultural boundaries through his art. Inspired by his 1980’s Chicago upbringing, Brantley’s work touches on tough subjects in a way that may be easily digestible to the viewer, by telling his stories through youthful characters and their adventures. Brantley’s work can be described as pop infused contemporary art inspired by Japanese anime and the bold aesthetics of street art pioneers Jean Michel Basquiat, Kaws and Keith Haring. While spray paint is often at the forefront of his mixed-media illustrations, Brantley utilizes a plethora of mediums from oil, acrylic and watercolor to non-traditional mediums like coffee and tea. A keen observer of life, Brantley calls upon his characters to help create different narratives throughout his work. Brantley’s recent focus is to share energetic narratives- moments of reality from his life and the lives of his peers, mixed with fantastical fiction- to create a fragmented environment of make believe. Brantley’s pieces evoke the quintessential combination of nostalgia and inspiration in those who are able to experience his works. 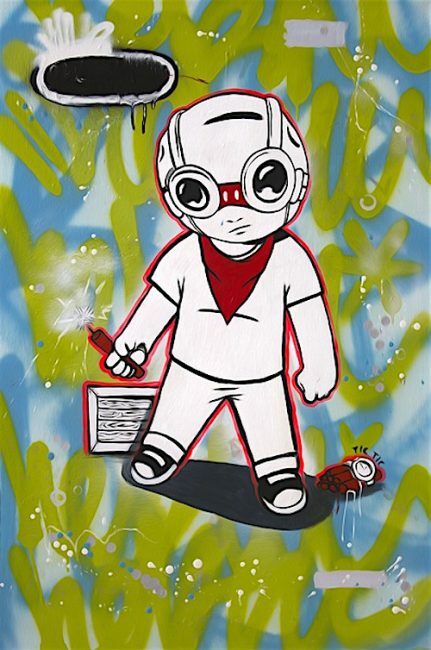 Recognized nationally for public works and solo shows in Chicago, Hebru Brantley has exhibited in London, Switzerland, San Francisco, Atlanta, Miami, Seattle, Los Angeles, and New York including Art Basel Switzerland, Art Basel Miami, Scope NYC and Frieze London. Brantley has been recognized in publications including the Chicago Tribune, Complex Magazine and NY Post. His work has been collected by many notable collectors. Brantley has collaborated with brands like Nike, Hublot and Adidas. Brantley earned a B.A. in film from Clark Atlanta University, and has a background in design and media illustration.